These are so much and you are very cute Dana :). WOW, just adorable! love your hair! Haha, funny pictures! And I totally love your hair!! I love men's with mustache. But your hair is amazing! I love the photos. The pictures are so cute! I love it :) Your hat is pretty awesome,too. Super cute!!! Love the mustache. Haha awwww these pictures are so cute!! Its nice that us girls can contribute to Movember somehow!! ahah you are so cute! And of course I'd like to follow you back. Hi, I'been walking around your blog and it's very good. You really have a funny smile. NOw I follow you: wait for you follow me back!!! So adorable. Is that in honor of Movember? This is so cute! I love your bow tie and bowler hat. So adorable! Hello girl, thank you for visiting my blog and for your care. You're a sweet girl! I love your blog is super creative and fun, you are amazing, congratulations! thanks for the lovely comment! I missed you too!! :) you're so funny dear! hahaha. it is a enjoyable post. What a fun post! Love that polka dot bow tie. You could totally also wear it as a cute headband. HAHAHA LOVE UR PICS! <3. thanks for the comments! 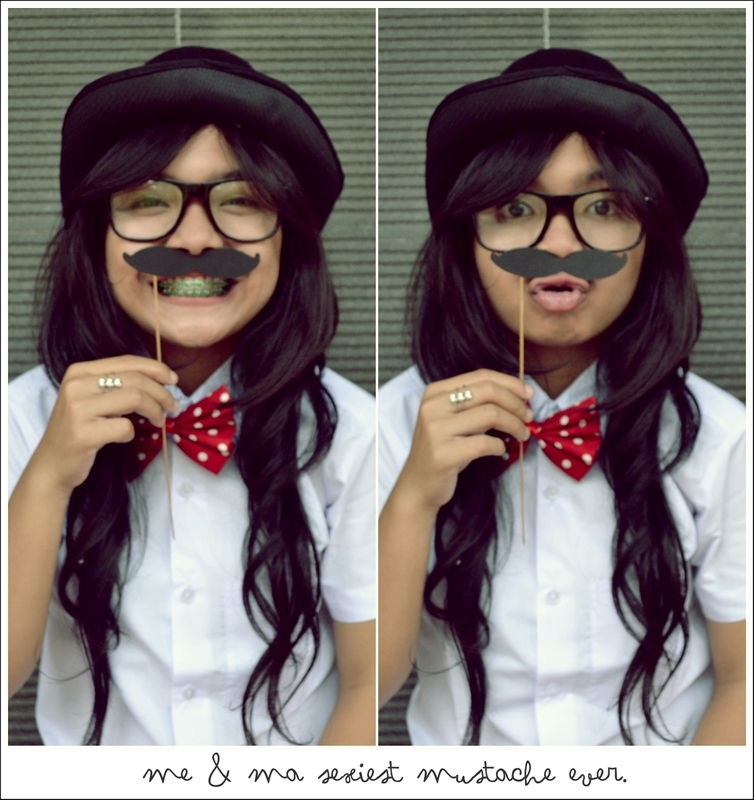 these are such cute mustache pictures!! follow each other? oh and p.s. your blog title is adorable! with the girl in pig tails and braces! this is super duper cute girl friend!!! how u do that mustache?where u buy it ?